Clogged drains or slow-running drains are a part of household life and eventually you will need professional Drain Cleaning in Apache Junction. It is something that should be left to knowledgeable experts. You want to avoid doing any serious damage that could make your headache even bigger than it already is. Clogged kitchen drains are the most common problem. The most likely culprits are soaps, grease and fats that build up on the inner walls of the pipe. 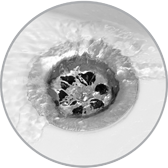 You will notice your drain emptying slower and slower as time goes by. Our drain cleaning machines will cut through any clog and remove all of the debris hampering the water flow through your pipes. Your bathroom is also a haven for clogged drains, we have you covered. Toothpaste and soap can clog the bathroom sink drain just like the fat and grease in the kitchen sink. Hair and soap can clog your shower or tub drain the same way. Toilets can be compromised by toilet paper and the occasional kids toy. Rest assured that we can handle those drain cleanings. Our heavy-duty equipment, along with our knowledge, shows even the tough jobs who the boss is. Basement and laundry room clogged drains are no match for us. Even outdoor drains can produce a serious clog problem and our drain cleaning service can handle those with no problem. We don't advise that you use chemicals purchased at a hardware or other store to unclog your drains. Not only can they be noneffective, there is possible long-term damage to some pipes that can be caused by these chemicals. Drain Cleaning in Apache Junction should be left solely to the experts. Contact us today for your clogged drain solution. Small or large jobs will be handled by us professionally and thoroughly.